Welcome to the 8's, our best seller. Do we sell so many because our puzzles are so good or because 8's are what students have the most issues with? Either way, we are happy to help students learn these tricky facts. 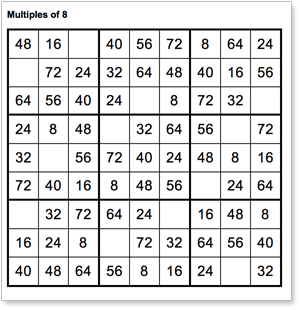 Children without a sound knowledge of their multiplication facts are at a profound disadvantage. Students without multiplication fact fluency spend more time determining routine answers and less time on more meaningful applications. Students who know their facts can build on these fundamental concepts and ultimately it will benefit their mathematical development.